Mild, moist and creamy when young, becoming drier and fuller flavoured with age. Swaledale and other cheeses such as Wensleydale, Cotherstone and Coverdale were introduced into England by monastic orders who settled in the Yorkshire dales after the Norman conquest of 1066. French monks were accustomed to making ewes' milk Roquefort and were encouraged by the invaders, who yearned for foods from their homeland, to move to England and continue their cheese making. Consequently, the first Swaledales were blue cheeses and it has only been over the last century that the Swaledale has become better known as a non-blue cheese. After the dissolution of the monasteries in the 16th century, production moved to farmhouses and later to small dairies. Over the past hundred years, farming in the dales has moved from sheep to cattle rearing, and the traditional ewes' milk cheese has become a rarity. Our Swaledale is made by David and Mandy Reed. They started cheese making in 1985 and took over the production of Swaledale from Marjorie Longstaff of Harkerside in Upper Swaldale when she retired. Although the majority of their production is from cows milk they do still produce some of the traditional ewes' milk cheese. It is this ewes' milk cheese which we sell. Their farm animals graze on the upland slopes of the Yorkshire Dales National Park in an area which is designated as 'environmentally sensitive' and where farmers are discouraged from using artificial fertilizers. 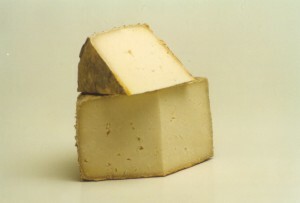 Swaledale is generally matured for three to four weeks and is enjoyed when mild, moist and creamy. It has a white paste and develops a fine grey moulded rind. We mature our cheeses for a further four to eight weeks to give a drier texture and a more pronounced flavour. In fact, during the 19th century the ewes' milk Swaledale was sometimes kept for 3 to 4 years becoming extremely pungent and served as a great delicacy at the dinner table. Swaledale can be made successfully throughout the year but cheeses made in late Spring are the most reliable in quality. Each cheese is approximately 2kg in weight, 150mm in diameter, 80mm high and has a fat content of 45%.